What are cellulitis risk factors? What causes cellulitis? Is cellulitis contagious? What types of health care professionals treat cellulitis? What is the outlook/prognosis for cellulitis? What are complications of cellulitis? warmth of the affected area. 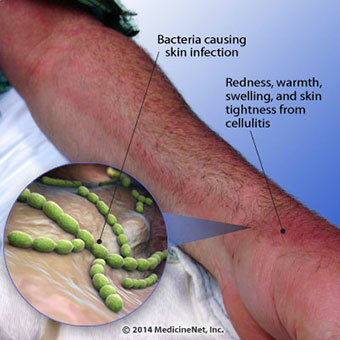 Cellulitis is a bacterial infection of the skin and tissues beneath the skin. Unlike impetigo, which is a very superficial skin infection, cellulitis is a bacterial skin infection that also involves the skin's deeper layers: the dermis and subcutaneous tissue. The main bacteria responsible for cellulitis are Streptococcus and Staphylococcus ("staph"), the same bacteria that can cause impetigo and other diseases. MRSA (methicillin-resistant Staph aureus) can also cause cellulitis. Sometimes, other bacteria (for example, Hemophilus influenzae, Pneumococcus, and Clostridium species) may cause cellulitis as well. Cellulitis has characteristic symptoms and signs. 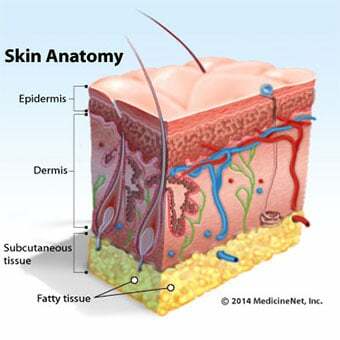 Symptoms usually begins as a small area of tenderness, swelling, and redness that spreads to adjacent skin. The involved skin may feel warm to the touch. As this red area begins to enlarge, the affected person may develop a fever, sometimes with chills and sweats, pain, and swollen lymph nodes ("swollen glands") near the area of infected skin. Cellulitis may occur anywhere on the body; the legs are a common location. The lower leg is the most common site of the infection (particularly in the area of the tibia or shinbone and in the foot; see the illustration below), followed by the arm, and then the head and neck areas. In special circumstances, such as following surgery or trauma wounds, cellulitis can develop in the abdomen or chest areas. People with morbid obesity can also develop cellulitis in the abdominal skin. Special types of cellulitis are sometimes designated by the location of the infection. Examples include periorbital and orbital cellulitis (around the eye socket), buccal (cheek) cellulitis, facial cellulitis, and perianal cellulitis. The signs of cellulitis include redness, warmth, swelling, tenderness, and pain in the involved tissues. Any skin wound or ulcer that produces these symptoms or signs may be developing cellulitis. Other forms of noninfectious inflammation may mimic cellulitis. People with poor circulation in the legs, for instance, often develop scaly redness on the shins and ankles; this is called "stasis dermatitis" and is often mistaken for the bacterial infection of cellulitis. Most commonly, cellulitis develops in the area of a break in the skin, such as a cut, small puncture wound, or insect bite. In some cases when cellulitis develops without an apparent skin injury, it may be due to microscopic cracks in the skin that are inflamed or irritated. It may also appear in the skin near ulcers or surgical wounds. In other circumstances, cellulitis occurs where there has been no skin break at all, such as with chronic leg swelling (edema). A preexisting skin infection, such as athlete's foot (tinea pedis) or impetigo can be a risk factor for the development of cellulitis. Likewise, inflammatory medical conditions or diseases of the skin such as eczema, psoriasis, or skin damage caused by radiation therapy can lead to cellulitis. People who have diabetes or diseases that compromise the function of the immune system (for example, HIV/AIDS or those receiving chemotherapy or drugs that suppress the immune system) are particularly prone to developing cellulitis. Conditions or diseases that reduce the circulation of blood in the veins or that reduce circulation of the lymphatic fluid (such as venous insufficiency, obesity, pregnancy, or surgeries) also increase the risk of developing cellulitis. The majority of cellulitis infections are caused by infection with either strep (Streptococcus) or staph (Staphylococcus) bacteria. 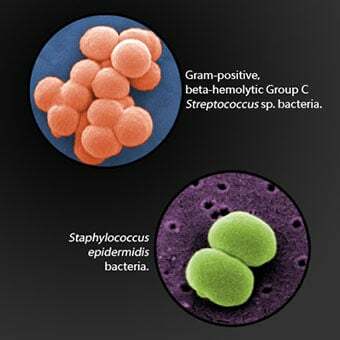 The most common bacteria that cause cellulitis are beta-hemolytic streptococci (groups A, B, C, G, and F). A form of rather superficial cellulitis caused by strep is called erysipelas and is characterized by spreading hot, bright red circumscribed area on the skin with a sharp, raised border. Erysipelas is more common in young children. The so-called "flesh-eating bacteria" are, in fact, also a strain of strep bacteria that can sometimes rapidly destroy deeper tissues underneath the skin. Fasciitis is the term used to refer to inflammation of the very deep lining tissues called fascia. The streptococcal infection known as flesh-eating bacterial infection is an example of fasciitis. Cellulitis, when untreated, may rarely spread to the deeper tissues and cause serious fasciitis. Staph (Staphylococcus aureus), including methicillin-resistant strains (MRSA), is another common type of bacteria that causes cellulitis. There is a growing incidence of community-acquired infections due to methicillin-resistant S. aureus (MRSA), a particularly dangerous type of staph infection that is resistant to many antibiotics, including methicillin, and is therefore more difficult to treat. Cellulitis can be caused by many other types of bacteria. In children under 6 years of age, H. flu (Hemophilus influenzae) bacteria can cause cellulitis, especially on the face, arms, and upper torso. Cellulitis from a dog or cat bite or scratch may be caused by the Pasteurella multocida bacteria, which has a very short incubation period of only four to 24 hours. Aeromonas hydrophilia, Vibrio vulnificus, and other bacteria are causes of cellulitis that develops after exposure to freshwater or seawater. Pseudomonas aeruginosa is another type of bacteria that can cause cellulitis, typically after a puncture wound. Cellulitis is not contagious because it is a soft tissue infection of the skin's deeper layers (the dermis and subcutaneous tissue), and the skin's top layer (the epidermis) provides a cover over the infection. In this regard, cellulitis is different from impetigo, in which there is a very superficial skin infection that can be contagious. Primary-care specialists, including internists and family medicine specialists, treat cellulitis. For patients who seek medical treatment at an urgent-care center or emergency department, emergency-medicine specialists may be the treating physicians. Sometimes infectious-disease specialists or surgeons may be involved in the medical treatment of cellulitis. First, it is crucial for the doctor to distinguish whether or not the inflammation is due to an infection. The history and physical exam can provide clues in this regard, as can sometimes an elevated white blood cell count. A culture for bacteria may also be of value in making a diagnosis, but in many cases of cellulitis, the concentration of bacteria may be low and cultures fail to demonstrate the causative organism. In this situation, cellulitis is commonly treated with antibiotics that are designed to eradicate the most likely bacteria to cause the particular form of cellulitis. If an abscess is present, surgical drainage is typically required. When it is difficult or impossible to distinguish whether or not the symptoms are due to an infection, doctors sometimes treat with antibiotics just to be sure. If the condition does not respond, it may need to be addressed by different methods dealing with types of inflammation that are not infected. For example, if the inflammation is thought to be due to an autoimmune disorder, treatment may be with a corticosteroid. In all cases, physicians choose a treatment based upon many factors, including the location and extent of the infection, the type of bacteria causing the infection, and the overall health status of the patient. Under some circumstances, cellulitis can be prevented by proper hygiene, treating chronic swelling of tissues (edema), care of wounds or cuts. In other cases, microscopic breaks in the skin may not be apparent and infection may develop. In general, cellulitis in a healthy person with an intact immune system is preventable by avoiding skin surface wounds. In people with predisposing conditions (see above) and/or weakened immune systems, cellulitis may not always be preventable. Cellulitis is a treatable condition, but antibiotic treatment is necessary to eradicate the infection and avoid complications and spread of the infection. Most cellulitis can be effectively treated with oral antibiotics at home. Sometimes hospitalization and intravenous antibiotics are required if oral antibiotics are not effective. Sepsis is a serious complication of cellulitis. If not properly treated, cellulitis can occasionally spread to the bloodstream and cause a serious bacterial infection of the bloodstream that spreads throughout the body (sepsis). Cellulitis may continue to spread and not resolve until antibiotic treatment is used. Typically, the symptoms disappear three to 10 days after you have begun taking antibiotics. Herchline, Thomas E. "Cellulitis." Medscape. July 5, 2017. <http://emedicine.medscape.com/article/214222-overview>.